What Causes Excessive Hair Growth In Females ? Generally, women have only fine hair on those areas of the skin where men usually tend to grow thick dark body hair, for e.g., upper lips, cheeks, chin, chest, back and abdomen. But in today’s generation, about 8-10 percent women have a condition called hirsutism or hypertrichosis which causes excessive hair growth in those areas of the skin. The main difference between normal hair on woman’s body and hirsutism is the texture. Unwanted hair are usually coarse and dark. The growth pattern of unwanted hair is similar to normal hair growth in males. Women basically develop excessive unwanted body or facial hair due to higher than normal levels of male hormones. Male hormones are called androgens, and they include testosterone. Normally all females produce androgens, but they are kept at a minimal required level. Androgens are basically produced by adrenal gland located just above your kidneys, testes and ovaries. Majorly androgens get converted to testosterone (male hormone). Certain medical conditions can cause a woman to produce excess androgens, causing male-pattern hair growth and sometimes other unwanted male features, such as deep voice. PCOS (PolyCystic Ovarian Syndrome) is one common cause of hirsutism. Non-cancerous cysts that form on the ovaries can affect hormone production, resulting in irregular menstrual cycle and decreased fertility. Women with PCOS often have symptoms of moderate to severe acne and tend to gain weight. Cushings syndrome, which occurs when your body is exposed to high levels of hormone cortisol also sometimes called ‘stress hormone’ (either due to over production by adrenals) or by taking prednisolone for a long period of time. Congenital adrenal hyperplasia, wherein people are born without an enzyme that is necessary to produce adrenal hormones. It’s a group of disorders that interferes with the adrenal gland and causes the body to produce more androgen. All of these above mentioned conditions can affect the way your body produces androgens. Hirsutism may also run in the families. You are more likely to have unwanted hair growth if your mother or sister also has it. 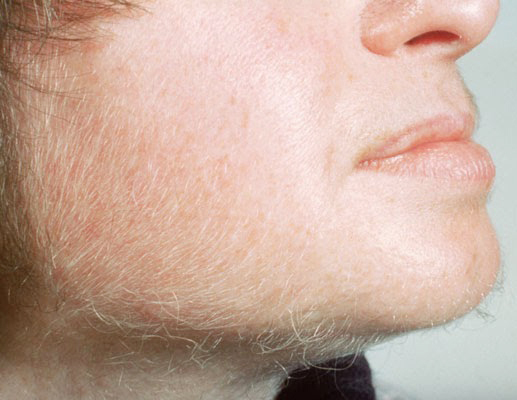 Treatment of hirsutism involves treating the underlying hormonal imbalance. Depending on the underlying disease (Cushing’s / PCOS / Congenital Adrenal Hyperplasia etc. ), homeopathic treatment can offer relief in stabilizing the hormones (subject to the pathology being reversible). To know more if your hirsutism can be helped with homeopathy, do get in touch with Dr Rajesh Shah’s associate doctors at LifeForce Homeopathy. You can leave your contact details in the form below or email us at info@lifeforce.in or call us at +91-22-66888888.